Necklace pendants are classic jewelry pieces that never seem to go out of style. With this Cartier Puffed Heart Pendant, you'll have an accessory designed by a jewelry company that knows how to produce quality. 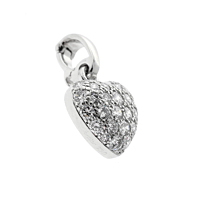 The pendant is made from white gold and diamonds to give you the sparkle that you deserve. Cartier's artisans meticulously select premium-grade diamonds for the company's jewelry. The jewelry maker also uses superior metals to ensure the long-lasting nature of its accessories. To develop an adornment that twinkles from every angle, the jewelry company's artisans painstakingly positioned each of the pendant's diamonds. 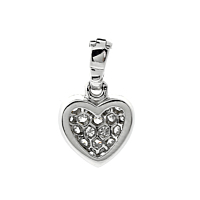 This diamond pendant from Cartier brings a touch of modernity to the classic heart design.